It’s been a while since I’ve posted, so I thought I’d catch you up. I’m just over 7 weeks away from my first marathon. 7 weeks, and 1 day. Don’t ask me to break it down into hours and minutes and seconds, because I’m nervous enough as it is. Being about 7 weeks out means some big things for me. It means that in the past few weeks, I’ve run farther in one run than I ever had before. Prior to February, I had run 15 miles at once exactly one time before, at The Spring Thaw LAST February. That was my furthest distance ever. That all changed in February. On the 8th, I ran 17.3 miles. This distance was cut into 3 segments so that I could meet up with A running group for the middle leg. So, i don’t know if the segments count quite as much. But then on February 22nd, I ran for 20 miles at The Spring Thaw. 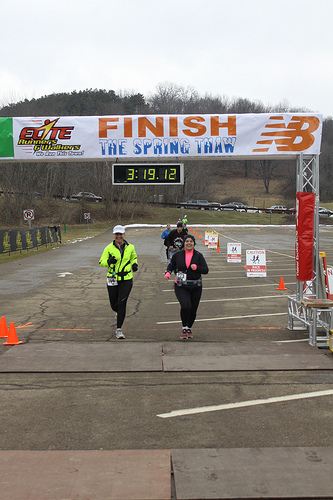 My Spring Thaw finish from 2013, 15 miles. This year, no camera remained since I came in after the course closed. By the way, notice my PINK shirt under the black. This is was by far, the toughest run I’ve done in a LONG time. I was unprepared when the course closed and the final 5 miles I had no hydration or energy supplements available on the course. I knew it would happen, I was just unprepared. 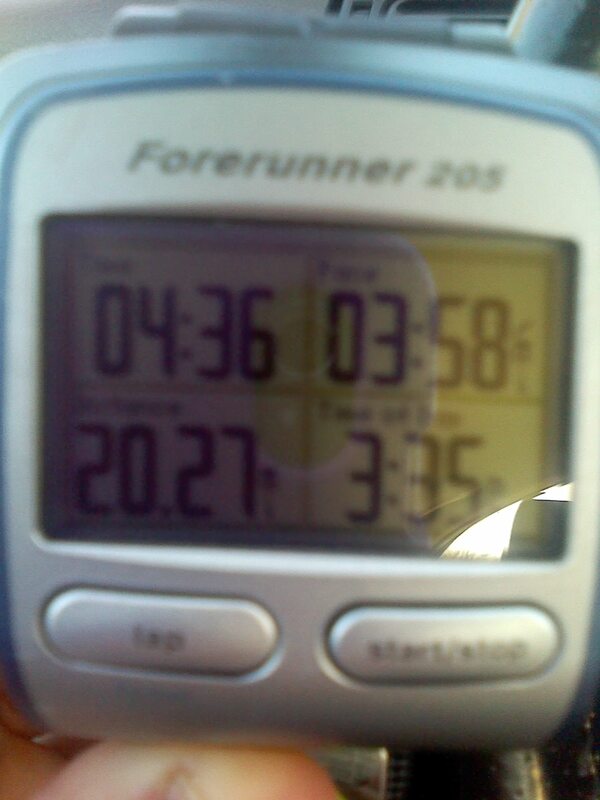 Since the course closed, my very unofficial time was 4:36:25 for 20.27 miles, as measured by my Garmin. the race director was still cleaning up, so I picked up my hard-earned swag, grabbed some pizza and soup, and headed home happy and upset at the same time. Can’t even muster much of a smile after 20 miles. 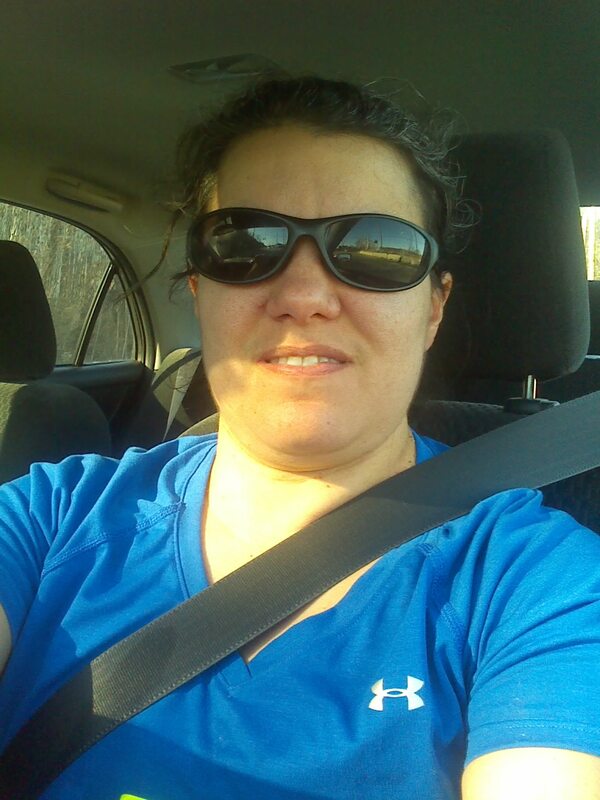 Evidence that I did complete my run for 20 (.27) miles at Spring Thaw, 2014. Tomorrow, I head out for my furthest distance yet, 23 miles. Yesterday I started tossing around the idea of doing this run on the course I’ll be running for The Pittsburgh Marathon, just 7 weeks and 1 day from now. It’s a challenging course (elevation map here), and I do better knowing what’s ahead of me. I’m anxious because I’ll be alone, in a city with lots of crazy drivers, and well, the city itself. I’m not a city girl. So, I pulled up the course map, and with the help of a city dwelling friend, shortened the course to around 23 miles. I plan on packing my gear up once my little boys go down for naps. I’m sure I’ll over pack, but after the last long run, I know I’d rather have too much stuff than not enough. So my lesson learned is to trust in myself and to provide for myself everything I need. Looking ahead, I know the course will be open for 6 hours, which means I need to maintain a 14:10 pace throughout. If my pacing continues as it has been, I’ll be finishing somewhere between 5:30 and 6 hours, so it could be close. After tomorrow, I’ll know even more. And after tomorrow, I will have done all but the last 3.2 miles. By the way, for more PINK SATURDAY fun, be sure to join Beverly at How Sweet the Sound. Since it’s St. Patrick’s Day weekend, you can also check out some GREEN this PINK SATURDAY. And, if you want some fun stories and brutal honesty about marathon training, be sure to read Onward! The Absolute, No B.S., Raw, Ridiculous Soul-Stirring Truth About Training For Your First Marathon by Brook Kreder, just make sure little eyes can’t read it with you or they get to learn some great words. I’m so happy/jealous!! Really….mostly happy for you! Jealous that I’m sidetracked with a knee/leg injury that’s not rebounding like I’d thought it would. I can’t even remotely comprehend the challenge you are taking on…..The half I did last fall is the longest distance I ever want to handle. However you are considersbly younger and fitter than I so I’m so glad you are not letting this goal/ dream pass you by. Just be careful out there tomorrow ………and good luck! You have more get and go than I do. I could never do that. Wishing you a great day and finish.